Honeywell's revenue is in decline, and the cost of turning that around may be higher than it's worth. The slow deterioration of Honeywell's (NYSE:HON) core business continued in the second quarter of 2016, and it may be too late to stop it. In figures released this morning, the company said sales rose just 2%, but that was only because of a recent acquisition spree. Organic sales fell 2%, and the only way the company kept improving the bottom line was because of cost-cutting. Honeywell even sees full-year 2016 results falling below previous expectations. Sales guidance was dropped by $300 million, to $40.0 billion-$40.6 billion, although cost-cutting caused a $0.05 increase in the bottom end of earnings guidance, to $6.60-$6.70 per share. The general theme of slow revenue growth and high net-income growth has been a long-term theme for Honeywell. If you look at the last five years, the company has barely grown at all on the top line, but net income has exploded. What should be concerning about this is that recent growth has been through acquisitions, which is an expensive way to grow the business. Management went on a $6 billion acquisition spree last year, which is five quarters worth of cash flow, and it only got a few points of revenue growth to show for it. The trends aren't going to change in the third quarter, either. Management expects overall revenue growth to be 4%-6%, and organic revenue to be flat to down 1%. Can Honeywell come back from this? The question investors need to ask is, will Honeywell ever return to growth? Or is this a business that will slowly decline as more innovative players take market share? One immediate concern is that Honeywell will be replaced by smaller, more nimble and innovative companies in home electronics. Ecobee, Canary, August, and Simplisafe are just a few of the companies coming after the company's home and commercial businesses. And they're building more consumer-centric devices that have become "cool" for homeowners. Honeywell doesn't quite hold the same cachet. If Honeywell were trading as if it were a company in decline, I might not think it was all that risky for investors. But shares currently trade at 17 times the top-end of 2016 earnings-per-share guidance. Given the negative organic growth, high cost of acquiring growth, and high valuation, I don't see much upside for shares. 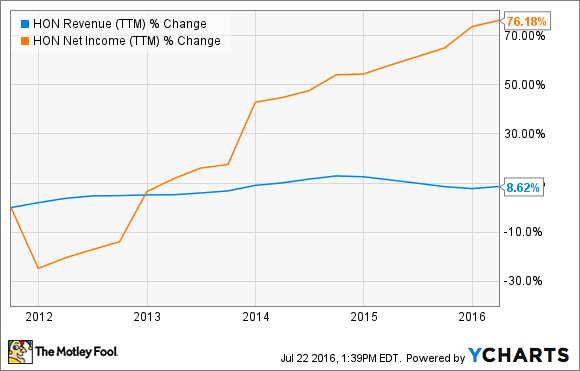 Honeywell can only squeeze more and more out of the bottom line for so long before it has to show top-line growth. And with Honeywell facing more and more competition in its end markets, I don't like the future for this industrial conglomerate.